Last year, I was fortunate enough to be invited to sample both the Granville Foodie Tour and the Richmond Foodie Tour run by Michelle Ng. It is a great concept really. A group of people pay one flat price to be taken to several restaurants sampling their wares. It is a good way to get a taste of everything without having to visit each restaurant individually. Vancouver Foodie Tours is back this year and it does cost more. Last year, it was a measly $10.00 per person because it was sponsored in part by the Downtown Vancouver and Richmond Tourism. Now it costs $60.00 and really, that is still reasonable considering the amount o f places visited. 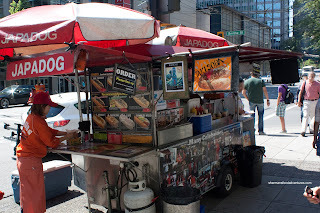 This time around, I was invited with other media to experience Vancouver Foodie Tours - World's Best Street Eats Tour edition. With the explosion of food carts in our city, it can get quite confusing what is out there, where it is located and when they are open. 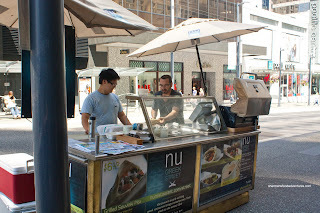 The food cart tour is best suited for those unfamiliar to the city and are not interested in doing their own research. 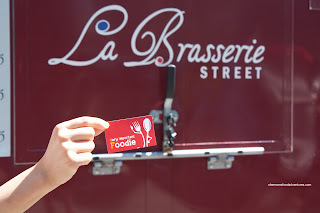 So we met up at the Vancouver Centre Skytrain Station where La Brasserie Street was located. We got to sample half of their Brass Chicken Sandwich. 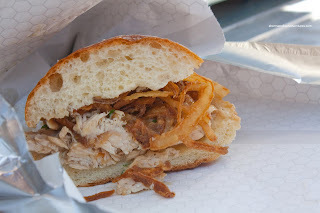 I've had the good fortune to try most of the food carts featured in this tour and one of my favourites was this particular sandwich. I love it when a sandwich gets messy. Much like the pulled pork sandwich from re-up, the chicken sandwich is dripping with gravy which makes the whole thing moist. The buttermilk bun does a good job in keeping things together while the fried onions adds crunch and sweetness. 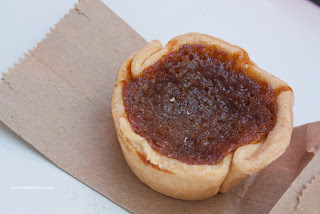 The Butter Tart supplied by Tartine claims to be "World's Best" (not usually part of the tour, we just got to try it). Well, by virtue of not being a dessert person, I'm not the one to either confirm or deny that claim. Personally, I found it a bit too sweet. It was like eating a whole lot of buttery caramel. However, in the end, it was still pretty good, so I'll leave it at that. - the Terimayo (which I believe is still the best one). Consisting of a beef sausage, teriyaki sauce, Japanese mayo, sautéed onions and nori, this makes all the other hot dog stands look boring (however, I'm sure there are those who still prefer a regular hot dog, which Japadog does sell). 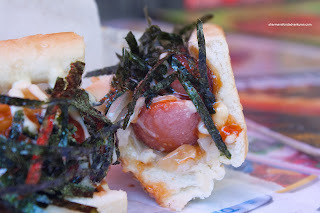 There is something about slapping teriyaki sauce and sweet mayo onto a hot dog that makes it taste good. After this we strolled over to where Poke'm used to be located. Now it has been replaced by a Banh Mi cart aptly named Bun Me. The cart reminds me a little of the Nom Nom Truck out of L.A. which was a participant on the Great Food Truck Race on the Food Network. Now we all know that Banh Mi is pretty widely available in Vancouver for roughly $3.00 - $3.75 depending on the store. However, that doesn't really include Downtown Vancouver. 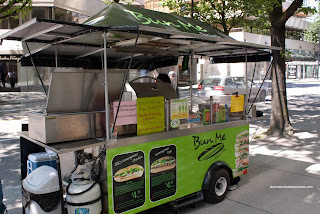 Other than a few other places, Bun Me offers up something that is under-represented in the Downtown core. Of course there is a slight premium to be paid, their Banh Mi costs $4.25. 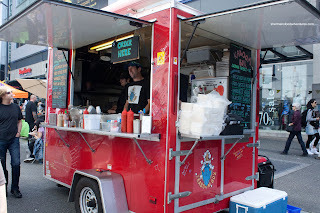 Yet, that is still considerably less than many of the other offerings from other food carts in the area. There are only 2 options: Lemongrass Chicken and Tofu. 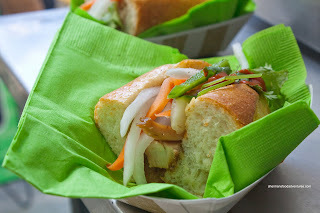 We tried the Lemongrass Chicken Banh Mi today and it included the usual pickled carrots and daikon, hot pepper (if you want), cilantro, mayo, cucumber and their special sauce. I found their bread to be crisp and slightly dense. There was plenty of ingredients packed into the baguette, so in terms of value, it was a winner. As for flavour, I would've liked to see the pickled carrots and daikon to have more acidity and for the chicken to have more lemongrass kick. With those 2 tweaks, I believe that the flavours in this sandwich would sing. We then headed over to Granville Street where we met up at Kaboom Box. For those who are familiar with Fresh Local Wild, the Kaboom Box replaces it on Granville with roughly the same menu. And about that menu, I remember having concerns about their Po' Boy and other sandwiches crossing the $10.00 threshold. That in itself priced themselves out of the food cart market. I'm happy to report that they have lowered their prices where all of their sandwiches (Po' Boy, Venison and Salmon) are only $8.00 each. 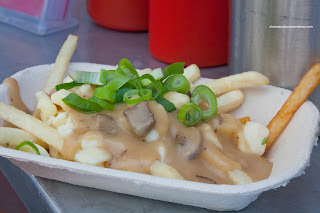 We didn't get to sample any of the sandwiches today; rather, we had the Mushroom Poutine. This totally vegetarian dish is comprised of fries, white cheddar cheese curds and mushroom gravy. For me, I liked the gravy. It was just right with a good mushroom flavour. However, the cheese curds were not squeeky and I found them a bit salty. Furthermore, I would've liked the use of a thicker cut and shorter fry. In the end, I felt that half of one of their fabulous sandwiches, in particular the Po' Boy or Salmon, would've been a better representation of their food cart. I'm sure there were cost concerns related to this. Finally, we ended up kitty-corner to where we started at Nu Greek Street. Incidentally, I had just tried their fabulous pitas the week before. So I was glad to be back. 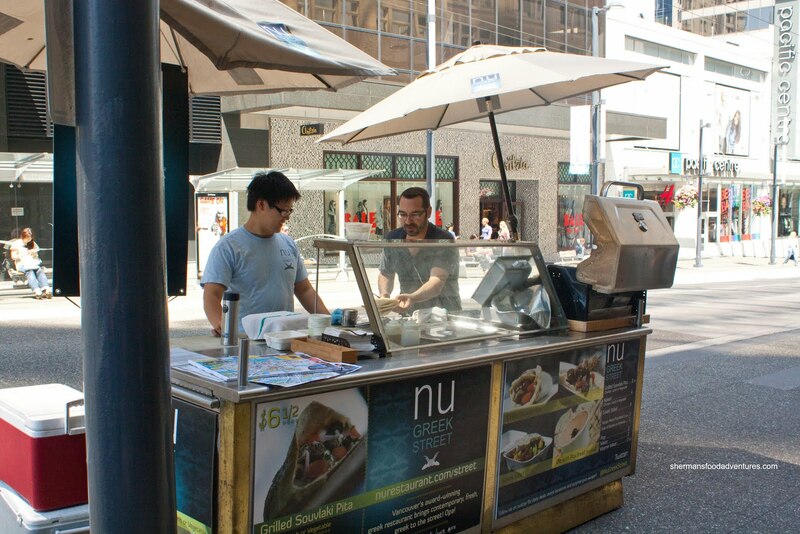 Part of the Kambolis Restaurant Group (which includes C, Raincity Grill and Nu), Nu Greek Street is their first foray into the food cart business. And low and behold, who was helping to man the cart today for our tour, Harry Kambolis himself (Coincidence? I think not...)! We got to sample a smaller version of their Chicken Pita. The star of this thing is the pita itself. It's fresh, soft, slightly charred and I would gladly eat it plain without any complaints. However, with the addition of a fabulous garlicky tzatziki, there are wonderful flavours and textures going on here. This was a great end to a pretty fun time going from food cart to food cart. However, I'm not sure if I would necessarily pay $50.00 for it. I could easily visit all of the aforementioned carts and have a full order of each item for far less than $50.00. Of course I wouldn't get a guided tour with interesting information about each cart. But then again, I'm pretty sure I don't belong to the target market of this tour. About the $50... Hmmmm... I don't think it is worth it. OK, probably as you mentioned, I am not their target audience but, c'mon, do you want to be eating all that food in a 2 hour span? Probably Mijune; after all, she can out eat even big men... I think it might be easier if you just get an app (if you have an iPhone or other similar) or visit sites with this info, and then schedule your own trip. After all, all of these places are within a five block radius of each other! @sherman @Kimho - thank GOD you wrote "OUT EAT"... and not other way around... omg someone said it other way around while they were introducing me at a wedding party once.. so embarrassing!! La Brasserie: that sandwich is quite heavy and greasy, maybe a decadent treat for tourists but not the most attractive option for those of us who work in the area. Haven't tried the butter tart, I prefer the shorter crispy-shell type. Japadog: awesome. It's funny that they feel like an older and established Vancouver cart now. The oroshi is not good as the toppings are too subtle to stand up to a dog, but the terimayo is fantastic (agree it's the best) and the kurobuta a nice treat. These are probably just as unhealthy as La Brasserie's sandwich but they don't feel as heavy to me (no gravy). Bun Me: pretty good, they'll probably do well with such a high-traffic location. The price is fine but I'll note for Sherman that the best banh mi in this area downtown is still Viet Sub (cheaper) and second best is One Saigon (not cheap). I agree with Sherman's suggested flavour tweaks. Kaboom Box: the smoked salmon with coleslaw is an excellent sandwich, the po'boy is another delicious but heavy treat and the venison burger is also well-loved by people I know (though mine didn't match up to the two just mentioned). Nu Greek: haven't tried it. Coma: not in your review, but I tried it today with friends. My bibimbap was quite solid with some nice fresh ingredients for about $7 (better with extra gochujang if you like it spicy like me). The seaweed rolls are a large portion and deep-fried so better as a shared appetizer than as your entire lunch! I had a bite of the burrito, it is tasty and hearty, stuffed with kalbi and egg (I think there are both beef and pork options). Hubbub: not a food cart, but I have to mention it as another great downtown lunch place. All the sandwiches are excellent and the salads are huge and delicious. @KimHo Yah, the Eatstreet App right? Probably better in this case. @FMF I have no comment. @Kano I have also tried Coma and love their Bibimbap. Good value too! Mangal Kiss set up a few months ago on Georgia between Howe and Hornby (north side of the Art Gallery). They offer shishliks for $7, that's a wrap with excellent Middle Eastern flatbread, killer steak or chicken and a super-fresh mix of incredible homemade pickled vegetables and condiments. The couple who run it are very friendly. There's also great daily homemade soups with a Middle Eastern theme. It's my unqualified favourite downtown food cart now. Everyone try it! Soho Road Naan Kebab is on Smithe between Howe and Hornby (between the courthouses). 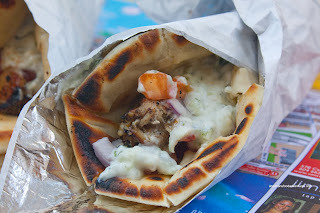 They also have wraps but they're butter chicken or tandoori chicken in naan made on the spot. There's a funny sign that says "UK style tandoori" or something like that - gotta love internationalism in food! The naan is great but my tandoori chicken was too dry and salty. It needed some yogurt and lemon juice or something. The guy serving was very friendly but the food was just so-so in my opinion. The butter chicken looks like it's the same chicken with butter chicken sauce on top so it should be less dry.